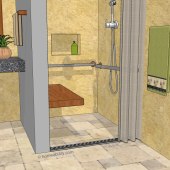 What is an Accessible Shower? be easy to enter and exit for all users alike, from those who can walk easily to those who rely on a wheeled mobility device. be designed so bathers can access all items including the shower controls, water, soap and shampoo from both a seated and standing position. provide helpful handholds or grab bars to hold onto for balance and support. 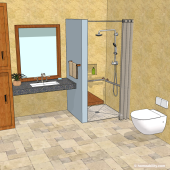 Following is a break down of the features most commonly found in an accessible shower, and an overview of important things to keep in mind when selecting, designing, or installing each. The shower’s entrance should be wide enough to allow a walker, wheelchair, or wheeled shower chair to pass through with ease. If the shower is being designed for a specific individual’s needs, make sure to take into account both the width of the person’s mobility device and their skills for maneuvering with the equipment when selecting an appropriate shower door width. In general, most (but not all) persons using mobility aids will be able to pass through an opening that is a minimum of 32″ wide. If you opt to install a shower door at the shower’s entrance (versus a shower curtain), it is important to be aware the hinges and door itself will occupy space inside the doorframe when in the open position, so to achieve a “clear opening” width of 32 inches for the mobility device to pass through, it will usually be necessary to install a shower door that is a minimum of 34 inches wide. 2. Shower Curtain or Shower Door: Which is Best? This is a common question that arises when designing an accessible shower. From an ease-of-access standpoint, shower curtains are usually preferable to glass shower doors, because a shower door creates one more obstacle for a person using a walker or wheelchair to contend with. Not only are shower curtains usually easier for most persons using mobility devices to manage, but they are also safer, because glass shower doors have a history of spontaneously shattering. “If” you do opt to use a shower door, make sure to install it so it swings outwards. Why is this important? Because if someone experiences a fall while inside a shower with an inward-swinging door their body can block the door from opening, making it difficult for rescue personnel to get them out. A flush, zero-threshold entrance is ideal. Even a small threshold of just one to two inches high can prevent entrance by a walker or wheelchair, consequently increasing the likelihood a person will have to ask someone else for help to get in and out of the shower. While a curbless shower is optimal, what if the home has concrete slab floors or other architectural design features that would make it more difficult (or impossible) to install one? If installing a threshold at the shower entrance cannot be avoided, try to install the smallest threshold possible, ideally the threshold should be 1/2 inch or less with a rounded (aka beveled) edge, which will allow most wheeled mobility devices to pass over. Shower seats come in a variety of shapes and styles, which include: stools, chairs and benches, some of which are portable, while others are designed to be attached to the shower wall. In general, wall-mounted shower seats will tend to be more stable than the portable-style bath seats (if installed correctly). The bench-style shower seats tend to be better than the stools and chairs because they have a larger sitting surface, making it is easier to land on safely when sitting down and can also provide you with a helpful place to rest a wash cloth or other shower items on the bench seat beside you. If you do opt to install a wall-mounted shower seat, try to leave one side of the seat exposed (free of walls) and provide ample clear floor space next to the shower seat, so a person using a walker or wheelchair can easily access the shower seat. By leaving one side of the seat exposed, it allows a person who uses a wheelchair to park their chair beside the seat, remove one of the wheelchair armrests and slide sideways onto the shower seat. If a shower threshold is present, it also makes it possible for a walker user to sit down on the side of the shower seat first, then lift their legs over the shower threshold from a safe seated position, thereby preventing the need to precariously step in and out. Standard overhead showerheads, that are fixed to the front wall of a shower, will typically reside too far away from where a seated bather performs their shower. 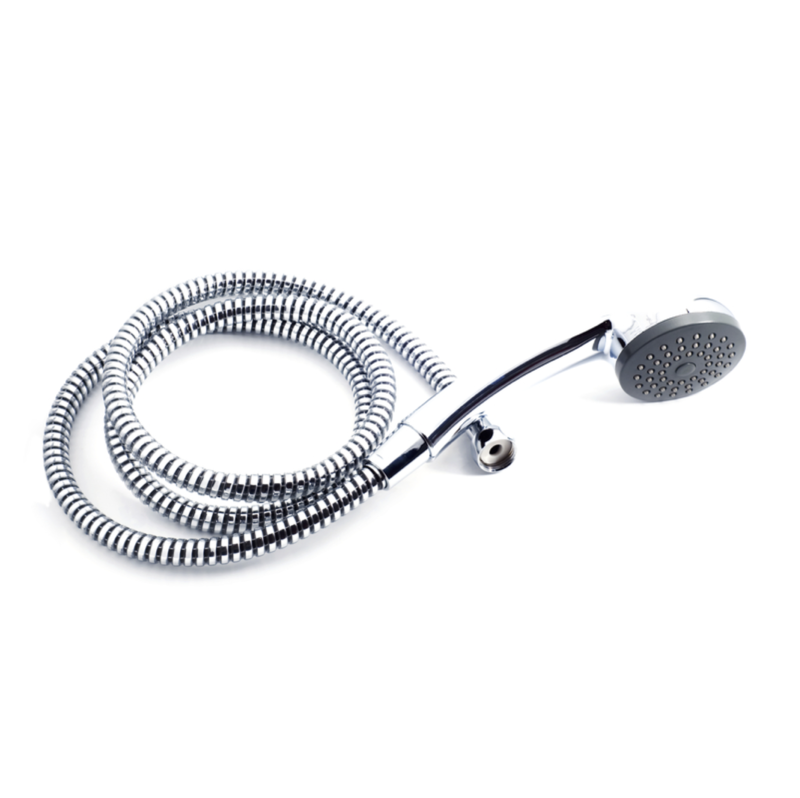 Installing a handheld showerhead, also known as an adjustable showerhead, can greatly enhances a seated user’s ability to access the water and bathe independently. Some handheld showerhead models simply consist of a showerhead attached to the end of an adjustable hose. Others come attached to a vertical slide bar that gets fixed to the shower wall. The vertical bar is helpful for holding the showerhead while a bather is soaping and shampooing. A few models with a vertical slide bar are cleverly designed to dual as a grab bar as well, giving bathers a safe place to hold onto while bending to wash legs and feet and for assist when stepping in and out of the shower. To learn more, visit Homeability’s Handheld Showerhead Guide. If you are designing a new shower, make certain to design it with the showerhead and shower controls located within easy reaching distance of the seat. It is unfortunately all too common to find “accessible” showers with a permanently installed seat inside that’s located nowhere near the water or shower controls! The controls should be installed in a location that is reachable both while standing outside the shower, as well as while seated inside the shower. This makes it possible to turn the water on and warm it up prior to getting in, as well as possible for the user to adjust the temperature when seated inside. A single lever-style shower control is easiest for most persons to operate, especially those with poor hand strength or arthritic fingers. It even allows a user the option to nudge it on and off with a wrist or elbow if need be. Make sure to include ample storage for shampoo, soap and razors within reaching distance of the seat. Storage shelves should ideally be recessed into alcoves in the wall to prevent them from interfering with grab bars and/or valuable clear floor space inside the shower. Don’t forget to provide a towel rack or hook within easy reaching distance of the shower seat! Install an anti-scald device for regulating the water temperature to help prevent burns and falls. Falls can occur when individuals try to rapidly retreat from a shower that is too hot or when water temperatures change unexpectedly (i.e. when someone else flushes a toilet elsewhere in the home). Make sure to select non-glossy, slip-resistant flooring materials for the shower stall and bathroom floor. Flooring with a slip-resistant, wet rated coefficient of friction (COF) of 0.6 or higher is generally considered safe. Examples of non-slip flooring include: porcelain tiles with a matte or textured finish, vinyl flooring with a nonskid polish, quarry tile with many narrow joints. If a tile floor is chosen, smaller sized tiles (E.g. 2”x2”) have more grout lines than larger tiles providing additional friction to help prevent the feet from slipping. Be careful that the grout lines present between tiles aren’t too wide (greater than ¾” ) or they will catch walker and wheelchair wheels making it difficult for a person to move and turn. Glossy floors should be avoided. They can be slippery and can also create a glare when lights reflect off of them, making it disorienting for an individual with unsteady gait or reduced visual skills. 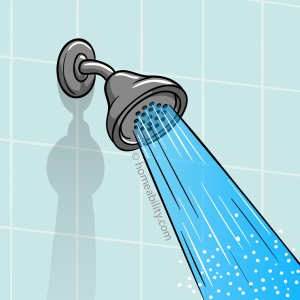 Most standard showers don’t include a light over the stall. With age, as well as with some illnesses, eyes tend to change, making it harder to see well when light quality is poor. 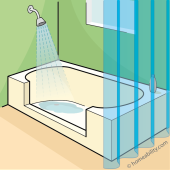 Installing a waterproof light over the shower stall can be a helpful, welcome addition. For persons who have respiratory problems or problems regulating body temperature, make sure to select a high functioning vent so it is easy to regulate the room temperature and humidity levels. A person with mobility issues will often move more slowly, requiring more time to get in and out of the shower. Furthermore, as age increases skin tends to thin, making it more difficulty to maintain body heat. Having a heat lamp can be a nice addition to help the user stay warm while getting in and out of the shower and drying off. For men who like to shave while in the shower, make sure to include a fog-free, adjustable height mirror. Common Design Errors to Avoid! Installing a wall on both sides of the shower seat, making it difficult or impossible for a person who can’t walk easily or at all, to access the shower seat. Unnecessarily installing a few-inch threshold at the shower stall entrance, when the architecture permits installation of a flush, curb-less style shower. Thresholds can make it more difficult or impossible for a person using a walker or wheelchair to enter the shower. Installing the shower head too far away from the shower seat, making it difficult or impossible for a seated user to sit underneath the running water while bathing. Installing the shower controls too far away from the shower seat, making it difficult or impossible for a seated user to independently access the on/off controls and temperature controls. Not installing a place to store the soap and shampoo within reaching distance of the seat! Not providing sufficient clear floor space (free of toilet, vanity and other obstructions) beside the shower seat so a user can easily approach the shower seat using their walker or wheelchair. 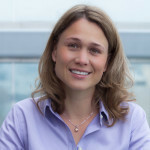 Not taking time to understand how a person performs transfers (e.g. standing up and turning, sliding from the wheelchair seat over onto the bath seat, etc) prior to selecting the shower stall size, designing the shower stall layout, and/or selecting the shower equipment. 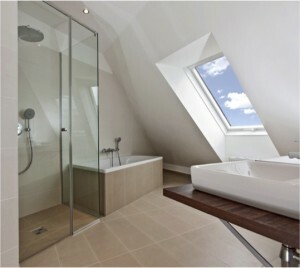 Curbless showers just make great design sense! They are versatile, accessible by all users, and beautiful in their simplicity. If your finances and the architecture of your home permits, having at least one curb-less style shower in your home (ideally located on the ground floor) is the best way to ensure you can enjoy a lifetime of hot showers. It’s just as easy for someone who can walk easily to enter a curbless shower, as it is for someone who uses a cane, walker, wheelchair or self-propelled wheeled shower chair. 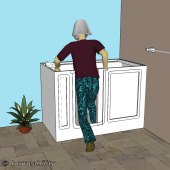 If you are helping create the design plans for an individual, the first step should be to have the person perform a few transfers to different surfaces (toilet, bed, chair etc.) and observe how they move, where they want to reach out to grab for support etc. If possible, have the person try out an accessible shower at a public pool, YMCA, hotel, or the hospital (if they are still an in-patient), and have them take pictures or a video of it so you can observe how they move. Ask them what worked or didn’t work for their needs (e.g. height of the seat, placement of the grab bars). 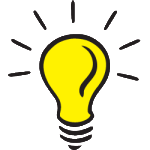 Then armed with this knowledge you can create designs that will best fit their needs and preferences.